The Spanish have a word for it: “duende.” Literally it means “elf” or “imp” or “troll,” but in a more mystical sense, it alludes to a “mysterious power” and a “spirit of the earth,” said 20th century Spanish poet and dramatist Federico Garcia Lorca. 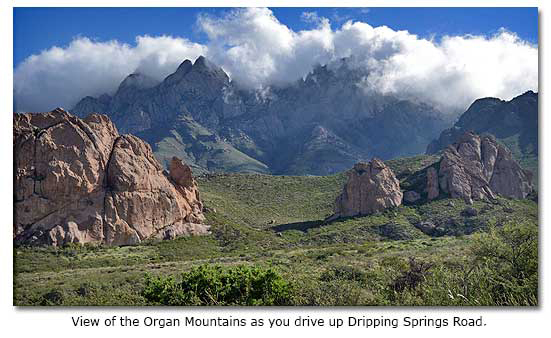 You can feel Garcia Lorca’s duende at Dripping Springs, a small life-giving mountain rivulet set in a narrow secluded canyon with towering granite walls on the western side of southern New Mexico’s Organ Mountains. It overlooks the Rio Grande and the Mesilla Valley 2,000 feet below. 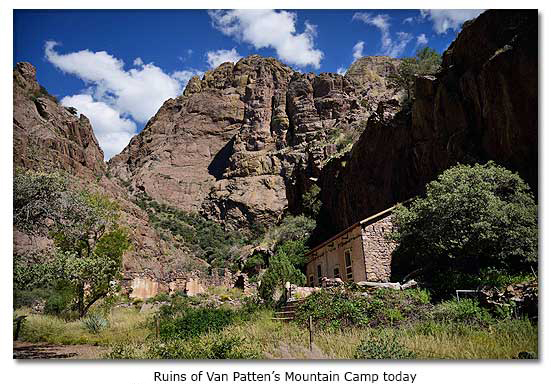 It was near this spring, in the 1870s, 15 to 20 miles east of the small communities of Las Cruces and Mesilla, that Colonel Eugene Van Patten chose to build his Van Patten’s Mountain Camp resort and, later, that Doctor Nathan Boyd would decide to establish a tuberculosis sanatorium. And it was near this spring, in the late 19th and early 20th century, that the people of the Mesilla Valley experienced both extremes of the spectrum of human experience—from gaiety and celebration to suffering and anguish. 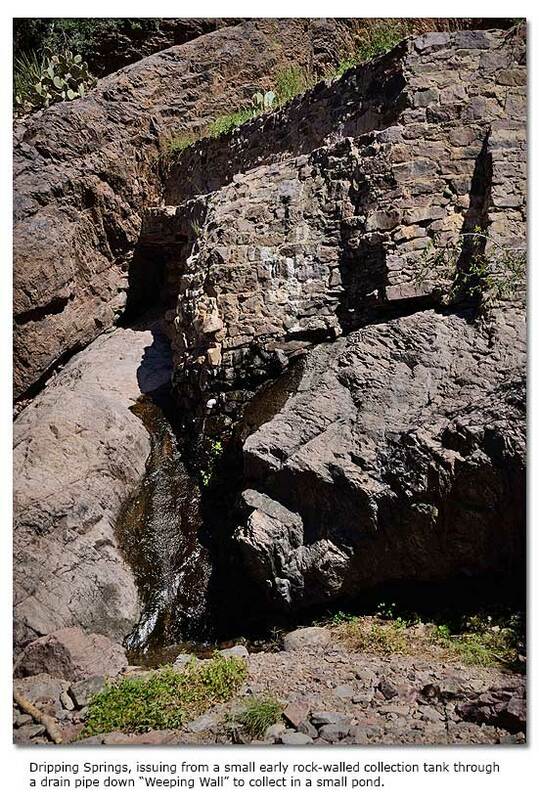 Today, standing before the granite surface – sometimes called the “Weeping Wall” – that conducts Dripping Springs’ stream of moisture into a small pond, you wonder about the source of the water. Issuing from what appears to be a solid mass of stone above, it seems almost magical. Among the crumbling stone walls of the resort in the stillness of an early evening, you might close your eyes and envision the clattering arrival of mule- or horse-drawn stagecoaches or carriages or buggies that have traveled over a long rough rocky road up the mountain flanks to deliver guests to the resort. You can imagine the lively conversations, in English or Spanish, of those who sought refuge from relentless summer heat and, sometimes, from enemies on the Chihuahuan Desert floor below. You can almost hear the soft Tiwa speech of Piro Puebloans who lived at the resort, cleaning the rooms, carrying spring water, managing the gardens, tending the livery, maintaining the access road, policing the grounds, and, sometimes, performing native dances. You can nearly taste festive meals of beef, fresh vegetables, milk and eggs produced on the site. By contrast, near the dilapidated wooden structures of the sanatorium, in the deep shade of the canyon walls, you can almost feel the terrible struggle of those suffering from the advanced stages of tuberculosis. As the New Mexico Office of the State Historian said, “Sanatorium treatment, common across the country and the globe, sought to enforce rest on patients in peaceful and climatically beneficial surroundings. Sanatoriums stressed altitude, the quality of the air and tranquility.” This made Dripping Springs, around the turn of the century, an ideal setting for the treatment of the time. If the sequestered ruins at Dripping Springs evoke, for many, images of a western frontier retreat set in a mountain hideaway, they raise, for others, the specter of otherworldliness. There have been reports, for instance, of a well-dressed and well-armed Mexican vaquero materializing from within the walls of a long-abandoned guest room; strange and sometimes tortured faces emerging from deep shadows; and death gasps issuing from long-empty sanatorium hallways. However you see them, the ruins and the setting hold an earth power and spirit. Van Patten’s decision to build a resort in such an isolated area in the Organ Mountains offers an insight into his adventurous personality. Like many of the extraordinary individuals who settled along the Mesilla Valley, he had chartered his own course in life—a complex story often muddied by confusing and, sometimes, contradictory records. Born in the small community of Rome in upstate New York on November 10, 1839, he attended West Point for two years. He traveled “around the world,” according to Paxton T. Price, Pioneers of the Mesilla Valley. He came to the El Paso and southern New Mexico region with three brothers, at the behest of their uncle, John Butterfield, to work for the Butterfield Stagecoach Overland Mail Company, according to the New Mexico-Land of Enchantment website. During the next few years, he would serve his uncle as a laborer, driver, conductor, stationkeeper and Indian fighter. In 1858, said Price, Van Patten, while, presumably, still employed by Butterfield, “had the distinction of riding the Pony Express to the new state of California with a special message for President James Buchanan.” After Butterfield had to shift his stagecoach service northward in the face of the looming Civil War, Van Patten joined Confederate General Henry Hopkins Sibley’s Army of New Mexico, serving as a private and bugler, said Martin Hardwick Hall, The Confederate Army of New Mexico. He participated in the bloody battles of Val Verde, south of Socorro, and Glorietta Pass, east of Santa Fe, suffering three wounds during the conflicts. After Sibley’s forces met disaster at Glorietta Pass, Van Patten managed to return southward, down the Rio Grande. Commissioned as an officer, he would take charge of the hospital treating wounded Confederate soldiers at Fort Bliss. At some point, he married Benita Madrid Vargas, a half-Indian, half-Spanish woman, whose family helped found Tortugas, the small community, just south of Las Cruces. It would be settled by descendants of Piro, Manso and Tigua Native American tribes. Through the legal system, Van Patten successfully turned back local efforts to evict the Native Americans from their land, enabling them to retain their church (which he helped build), their homes and their tribal offices. Meanwhile, he joined a local militia to fight Apaches and cattle rustlers under the leadership of the well-known Major Albert J. Fountain. A commissioned officer, he raised Company D of the New Mexico National Guard. He helped organize a New Mexico branch of Teddy Roosevelt’s “Rough Riders” for the Spanish-American War of 1898. As the years passed, he would, according to Price, serve the region in many other ways, including as El Paso County sheriff, Doña Ana County sheriff, U. S. Marshall, Mesilla district court interpreter, and Las Cruces Justice of the Peace. 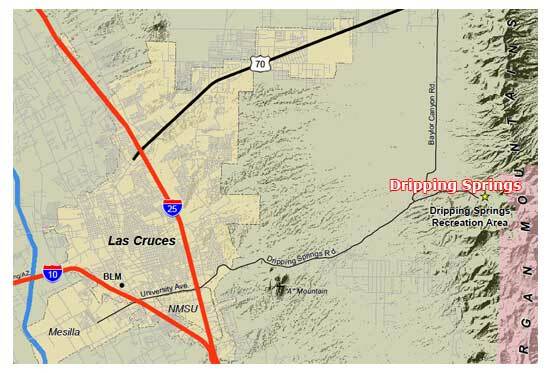 He even played a part in bringing the railroad to Las Cruces. He served as a co-founder of New Mexico State University—a role that gave him particular pride. Among many other enterprises, he acquired considerable land holdings, and drawn by the lure of Dripping Springs in the 1870’s, the enterprising Van Patten began construction of his resort, “a two-story 14-room hotel with dining and recreational facilities,” according to an interpretive sign at the site. “The hotel was constructed of native rock from the canyon and put together and finished with mud-mixing plaster. The grounds were attractively landscaped and featured a gazebo which served as a bandstand. Interior ceilings were covered with tightly stretched muslin cloth and patterned wallpaper decorated many of the rooms.” Later, according to Price, Van Patten would add some facilities for tubercular patients. Nearby, he built a livery, where guests could stable horses and mules and park coaches and wagons. He drew staff from the Tortugas Indians—presumably acquaintances of his wife. The resort, invested with the magic of Dripping Springs, attracted many notable guests, including famous lawman Pat Garrett, the fabled Mexican revolutionary Pancho Villa and, possibly even the notorious Billy the Kid and one of his buddies. It was here that the daughter of Major Albert J. Fountain learned that her father and eight-year-old brother had been murdered in their carriage not far east of the Organ Mountains. 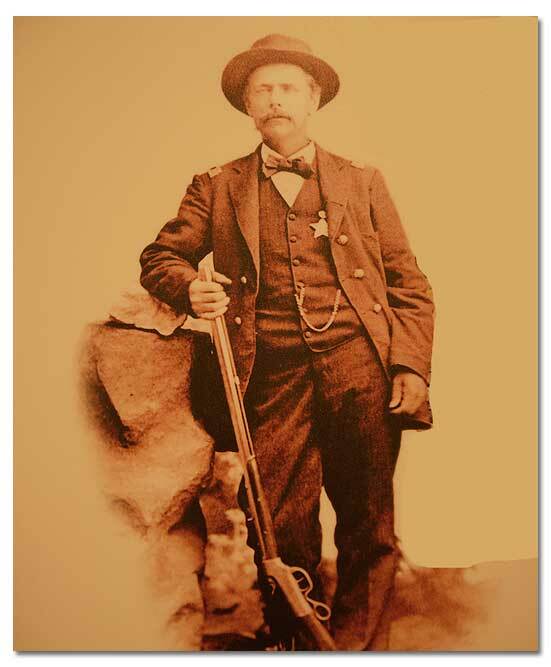 Van Patten led a posse to the murder site in a fruitless effort to find the bodies and track down the killers. Some three decades after he built his resort, Van Patten rented nearby land to Nathan Boyd, a doctor and international entrepreneur. Within a year, the two became entangled in a prolonged and bitter dispute and litigation, which, apparently, revolved primarily around land and water. By 1916, Van Patten, bankrupted by legal costs, gave up hope. Now an aging man, he effectively turned Dripping Springs over to Boyd, selling it to him for $1. Van Patten would die destitute a few years later. Today, he lies buried in St. Joseph’s Cemetery in Las Cruces. Like Van Patten, Dr. Nathan Boyd charted his own course in history—an adventurer in his own right. Born in Illinois, he studied medicine in San Francisco. He lived in Philadelphia, where he edited a London medical journal. At some point, he lived in England. He practiced medicine in Australia, where he married an Australian woman. 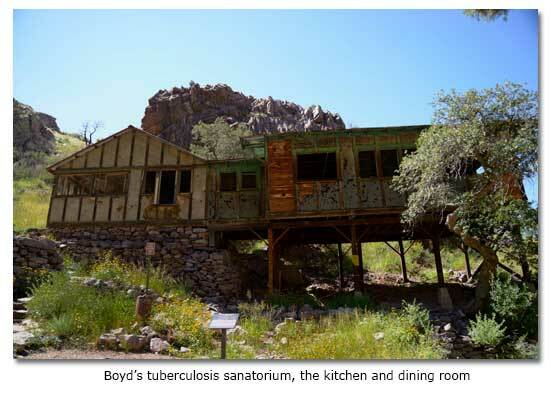 Sometime after his wife contracted tuberculosis, Boyd moved his family to Las Cruces and took up residence at Dripping Springs, placing his faith in the conventional wisdom that the high dry climate of the location would relieve her disease. He also planned, said Price, to “build a large sanatorium at the Springs.” In the meantime, in the 1890’s, the enterprising Boyd, with a British firm, formed a corporation which proposed construction of a dam across the Rio Grande somewhere in the vicinity of the current Elephant Butte dam. As envisioned, the new corporation, said Price, “would become a gigantic land-owning firm by selling irrigation water to farmers below the dam. The farmers would pay for irrigation water by forfeiting one-half of their land!” The concept triggered furious protests and disputes downstream, with New Mexico and El Paso landowners and with Mexico. Subsequently, in the face of the resistance, the project would collapse. Under Boyd’s ownership and with his sanatorium, Dripping Springs changed dramatically, from a place of gaiety and celebration to one of struggle and despair. As a sanatorium, however, it would begin to fail during the 1920s, when high dry air and tranquility began to give way to new vaccines and treatments as a more effective means for dealing with the disease. Boyd, under the weight of declining business ventures and mounting legal expenses, sold his Dripping Springs property to a Las Cruces physician, Dr. Troy C. Sexton in 1922, and moved to Washington, D.C. The sanatorium would shut down within a few years. Eventually, rancher A. B. Cox would acquire the Dripping Springs land, using the water for his livestock. Scavengers, weather and time have taken a toll on the structures. Today, the Cox ranch house, located about a mile and a half from the springs, serves as a visitor center.